Situated in the NEC, the newly-named Resorts World Arena (formerly Genting Arena and LG Arena) has played host to an array of world-class artists, with acts such as Queen, the Pet Shop Boys and David Bowie having graced its stage in the past – with the likes of Mumford & Sons, Manic Street Preachers & Red Hot Chili Peppers more recently playing the arena. Offering both atmosphere and intimacy on one hand, as well as the space for 15,700 screaming fans on the other, the Resorts World Arena has shows and experiences for everyone. If it’s a quick snack, a few drinks and some merchandise you’re after, Forum Live boasts a wide variety of all of the above to indulge in before the main event. Although, for those interested in buying merchandise, please be aware that there is no cloakroom on site to store it. Disabled visitors have access to a designated car park which is situated within a short distance of the arena and is manned by members of the management team. The Arena also has designated seating areas for wheelchair users. Wheelchairs are available to hire, but are subject to availability on the day. The Arena’s box office is situated to the left of the main venue entrance. The box office usually opens at 4pm on the day of each show – but specific event opening times can be found by calling 0844 581 1311. The Resorts World Arena is famed for welcoming huge artists and famous comedians, as well as some of the nation’s biggest shows and events. Please visit resortsworldarena.co.uk to find out more. The Resorts World Arena is easily accessible from Junction 6 on the M42 and Junction 3A on the M40. For sat nav users, enter postcode B40 1NT to the NEC and follow signs to the Arena. The NEC has 16,000 car parking spaces on offer. Once parked up, sign posts lead the way to the Arena entrance. Customers can also purchase parking when booking event tickets to secure a space. The site runs a free shuttle bus from the east car parks to the Arena entrance on show days, and usually operates from half an hour before doors open to one hour after the show finishes. All shuttlebuses are wheelchair accessible. 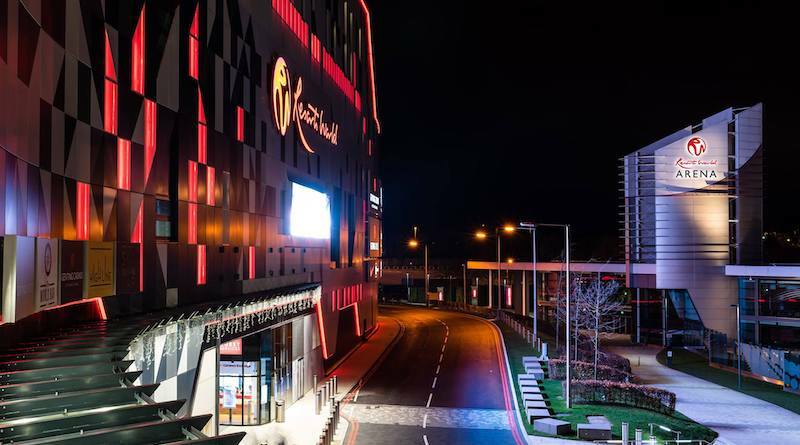 The Resorts World Arena is located right next to Birmingham International rail station, which is accessible via regular trains from Birmingham New Street station. The arena is then just a short walk through the connecting walkways between the station and the NEC. The number 900 bus regularly runs to the Arena and can be caught from Birmingham Moor Street train station, Solihull bus station and Birmingham Coach Station. Taxis are also available outside of the main NEC entrance. For more information on public transport in the West Midlands, please visit networkwestmidlands.com.